← September Queer Country Monthly This Saturday! 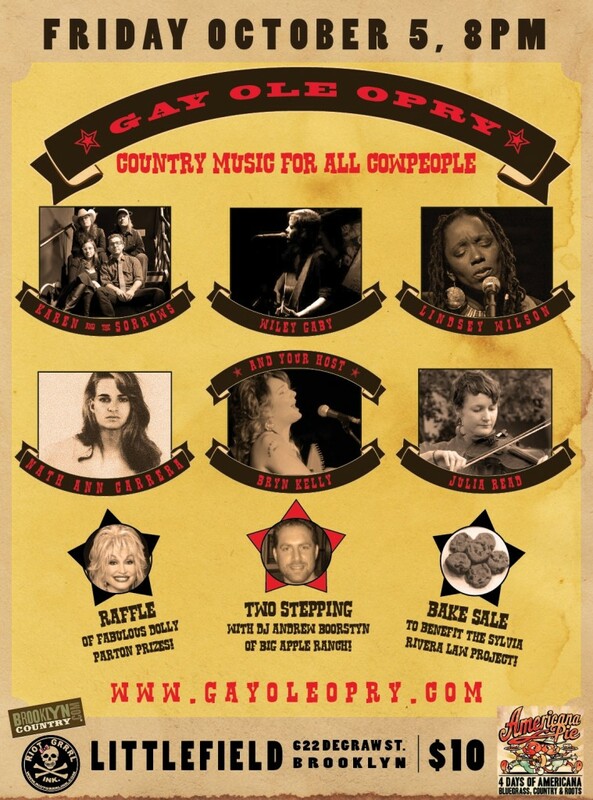 The Gay Ole Opry is Coming! The Opry returns! With so much awesomeness you won’t know what to do with it all! Starting at 8:00 pm sharp, there will be music from Wiley Gaby, Karen & the Sorrows, Lindsey Wilson, Nath Ann Carrera, Julia Read, and, of course, the Opry’s own Bryn Kelly, our host for the evening. Plus, a bakesale to benefit the Sylvia Rivera Law Project. Plus, the second annual Dolly Parton raffle. Plus, Susanna from Big Apple Ranch will give us all a two-stepping lesson and then DJ Andrew will make sure we two-step the night away! And Syd London will be there to get it all on camera, so you know you’ll want to look your best. AND we’re working on a special queer country community story-telling project that we’re gonna need your help with, so get ready. More details coming soon. We’re also the opening night of the four-day Americana Pie Festival, so if you’ve been longing for more Brooklyn country music, this is the weekend you’ve been waiting for. WHEN: Friday, October 5th, doors at 7:00, show starts at 8:00pm sharp! The Opry is brought to you by Brooklyn Country and your co-producers Karen & the Sorrows and Riot Grrrl Ink, the largest queer record label in the world. Notes: With music from Wiley Gaby, Karen & the Sorrows, Lindsey Wilson, Nath Ann Carrera, Julia Read, and, of course, the Opry’s own Bryn Kelly, our host for the evening. A bakesale to benefit the Sylvia Rivera Law Project. A two-stepping lesson from Susanna of Big Apple Ranch and then DJ Andrew will make sure we two-step the night away. And the second annual Dolly Parton raffle. This entry was posted in Gay Ole Opry. Bookmark the permalink.